The Beatles were a band unlike any the world had ever seen, and Beatlemania was a fandom unlike any it had seen. For many young music lovers in the 1960s, The Beatles weren’t just a band, they were a reason to live. But beyond the initial fervor, the Beatles progressed into a cultural force, their compositions and attitudes forever changing the pop music experience for their generation and many more to come. 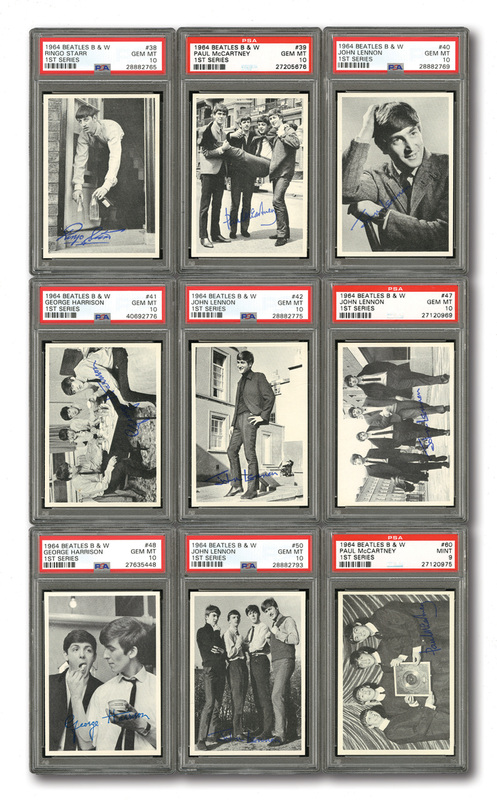 In 1964, during the height of Beatlemania on America's shores, which included their landmark appearance on the Ed Sullivan Show, Topps produced no less than six separate cards sets featuring the Fab Four. 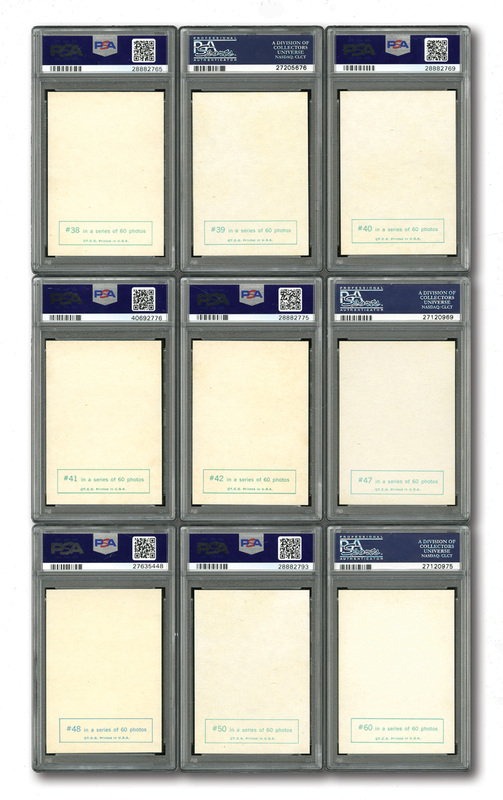 Presented here is the #1 All-Time Finest PSA Graded 1964 Topps Beatles Black & White - 1st Series Complete Set (60) according to the PSA Set Registry. The quality of this set in nothing short of extraordinary. Identified on the Registry as “DAY TRIPPER,” the set carries a GPA of 9.05 with an overall rating of 9.87 with Top Pop Bonuses factored in. 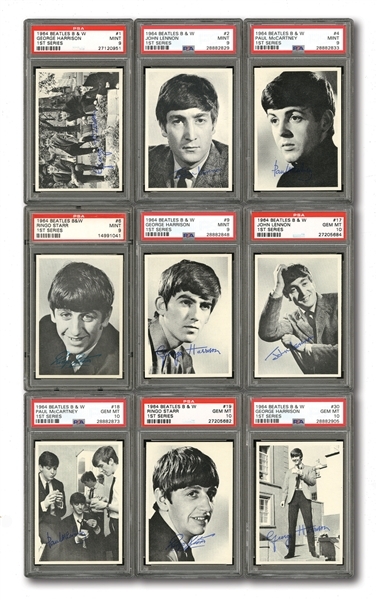 Includes: PSA Gem Mint 10 (14): #17 Lennon, 18 McCartney, 19 Starr, 30 Harrison, 38 Starr, 39 McCartney, 40 Lennon, 41 Harrison, 42 Lennon, 47 Lennon, 48 Harrison, 50 Lennon, 51 Starr, 52 Harrison. ; PSA Mint 9 (35): #1 Harrison, 2 Lennon, 3 McCartney, 4 McCartney, 5 Lennon, 6 Starr, 7 Lennon, 8 Starr, 9 Harrison, 10 Harrison, 14 Harrison, 15 Harrison, 16 Lennon, 20 Lennon, 21 McCartney, 22 McCartney, 25 McCartney, 26 Starr, 27 McCartney, 28 Starr, 29 Starr, 32 Starr, 34 Lennon, 35 McCartney, 36 Harrison, 37 McCartney, 43 Starr, 44 Lennon , 45 McCartney, , 46 Harrison, 49 Starr, 53 Harrison, 58 McCartney, 60 McCartney. ; PSA NM-MT 8 (11): #11 McCartney, 12 Starr, 13 Starr, 23 Harrison, 24 Starr, 33 Lennon, 54 McCartney, 55 Lennon, 56 Harrison, 57 Lennon, 59 Starr. 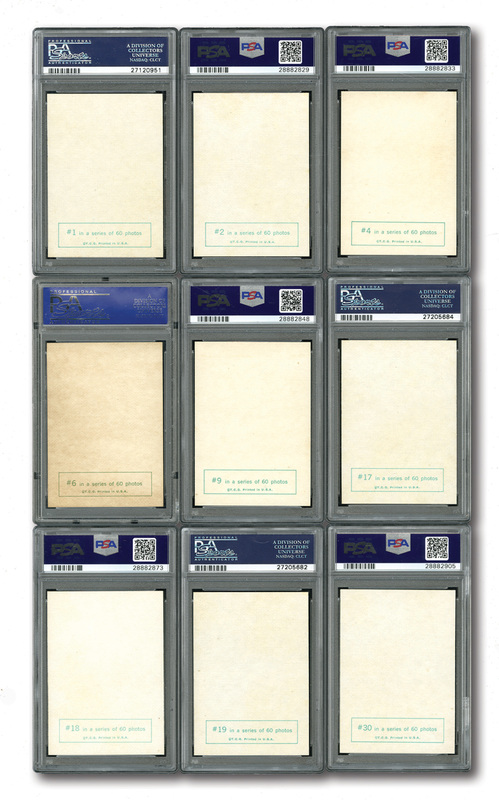 Given the extraordinary number of Pop 1 cards in this assemblage, it is safe to say this set will likely never be surpassed.